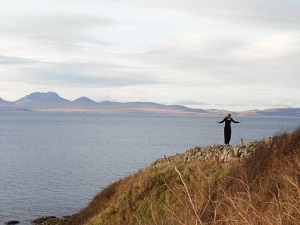 Come with me, back to Scotland, to the cliff that faces my family’s land — and the sea. 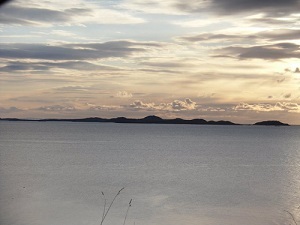 We’ll sit and sip a cuppa as dolphins cross the Sound of Jura, fins flashing just above the horizon. We’ll listen for the icy waves that foam through the nooks of the rocky Highland coast. We’ll watch sunsets disappear behind island peaks and marvel at the way mountain and ocean blend until you can’t tell one element from the other. We’ll close our eyes, breathe in the salty, heathery air, and know: this is home. How did we get here? Where does this adventure begin? Perhaps if I’d written it in order, my story would just sound like the gap semester of another college girl. But it all begins long before our moment on the cliff. Generations before, in fact. Mum’s family had lived in Africa since the mid-1800s. My great-great grandfather, the son of a Scottish shipping agent, travelled to Cape Cod by ship, then up the Zambezi River to become a missionary explorer. Together, he and his wife raised a family between two continents. And so did their children. And their children. Like most missionary children they were sent back to Britain for boarding school, often spending summer holidays with distant cousins rather than braving the long voyage home. My great-aunt Joan chose to stay in Britain…and met a farmer on the west coast of Scotland. My grandmother Betty, however, returned to Africa to become a missionary’s wife. And there, my mother was born. Mum fell for a soft-spoken Texan who was passing through on a church trip, and followed him to the US. I grew up between Atlanta and Chicago, but spent part of most years visiting family on different continents. When we weren’t celebrating Christmas under steaming mango trees in Zimbabwe, we traveled north by train from London to Glasgow, wind through the mountains, and down the Kintyre peninsula to the Atlantic Ocean. I have selective, but bright memories of our holidays in Scotland: store signs in a language that I couldn’t understand (though few people spoke Gaelic even then), Highland accents that stuck in the back of your throat like toffee, villages with the unlikely names of Lochgilphead, Ardrishaig and Inverary that sometimes boasted no more than a handful of houses and a post office. It was nearly an hour’s drive to the closest shop. “Going into town” was more of a family event than a quick stop on the way home from work. My cousins lived in a big grey stone house by the only road above the sea. It had an endless number of rooms (or so it seemed to my sisters and me! ), two kitchens, and bathtubs you could swim in. On windy days, we’d hang the washing outside on clotheslines and watch it snap and bend in the brisk breezes. I loved the house and its fireplaces and narrow hallways, but most of my best memories of Scotland are of my family’s holiday park. If you walked from the house towards the sea, past the sheep fields and the ruins of a stone farmhouse, the road would open up to a round, grassy knoll covered with neat rows of white caravans. The rocky beach, with its piles of slippery kelp, curved in a half moon around the Sound of Jura. Welcome to Port Bàn. Named for a cove that faces the Hebridean Islands, it has been my family’s haven since I was a little girl. In Gaelic, Port Bàn means “fair harbor”. At the front of the park, just before the shore, is a wide-open space with football nets and even a few holes for miniature golf. Here families coming down for bank holidays can relax as children run about dodging the small, but ever-present rabbit droppings. If you take the lane halfway up the cove, past the coin laundry on the left, you can see the little store and cafe straight ahead. The store sells everything from postcards, tea and trash bags, and other essentials of family camping, to toys for the children and souvenirs by local artists. The café, run by the aunties and various cousins, served fish and chips, shepherd’s pie, tea, biscuits, pudding and other well-loved British treats. For my family, it was oatmeal and sandwiches in the caravan, especially if Dad were there. But if it were up to Mum, we’d be trudging up the road every day for chips and a chat. Uncle Peter married a Lebanese lady, and Auntie Fiona the son of a Ghanian chieftan. Mark settled as a fisherman on the peninsula with Vee, a singer who had a voice like smokey 1930s jazz. Auntie Vrecka loved and divorced an Irishman with a lilt to his voice — he was always adding “so you knows” and “so I dos” to the end of every sentence. Jeannie traveled as a missionary and Ellie, the baby of the family with a sweet, absent smile, stayed near home to help her aging mother. 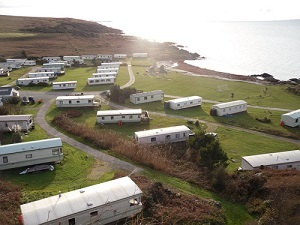 The twins, Morar and Cheryl, took charge of the holiday park, leaving the rest to drift in and out on all occasions. We’d arrive earlier than everyone else, me, Mum and the girls. Dad was only able to get away from work for a few weeks, thanks to a stellar work ethic drilled into him by American society. Occasionally, we stayed up at the big house, but I preferred the caravans. They were so cozy! Narrow bedrooms, a bathroom, kitchenette and one long, wide room that looked out on the Sound. If I squinted, I could see the three peaks of Jura across the misty water. I would lie awake pretending that I was on a ship at sea, tucked in my bed and listening to the waves crash on the bleached shore. At sunrise, I’d run outside with my sisters to sink our feet in the cold, brown kelp and search for shells in its depths. We were sure that the rock pools just off shore hid mermaids and selkies with long dark hair and wide, glossy eyes. I’ve been back to Port Bàn several times in recent years, and am always discovering something different: new crags and caves to explore, an espresso machine in the café, even a phone signal! Scotland to me is home. It’s where I belong. I love the weather in all its moods: breezy and heather-smelling, wild and tempestuous, and frigid with the air of the Atlantic. I love the cousins, the feeling of being part of a huge, albeit crazy, family. And no matter how far I travel, or how caught up I am in the minutiae of daily life, all it takes is a cup of tea, or a windy day, and I am back; back by my family’s fair harbor.